"Daniel Ellsberg On Richard Clark"
threat.level/index.html dwarfed by Orange Christmas, Mad Cow in America, and Jacko's Lament -- LAPD, department of Precrime, have made "pre-emptive" arrests of "people who came to authorities' attention after the September 11, 2001, al Qaeda terror attacks in the United States." Never mind that there's absolutely no evidence "al-Qaeda" attacked the Empire on that fateful morning over two years ago -- or that al-Qaeda even exists as proclaimed ad nauseam by the Ministry and its puppet handlers in Washington -- these hapless and nameless individuals are suspected of plotting nefarious crimes, although none are "charged with any terrorism-related offense but were rounded up on unrelated charges -- in one case, credit card fraud -- in an effort to get information about possible threats." In other words, these individuals were arrested, even though they didn't actually engage in any criminal behavior. "It's hardly coincidental "a number of grand jury subpoenas have been issued in the Los Angeles area" a day or so after Code Orange was imposed on Christmas shoppers and travelers. It's all designed to scare the public witless and soften them up for more scary things to come. "Meanwhile, the Bushites want to extend Code Orange beyond the holidays. "No one should assume that once we get to Christmas and after New Year's that people should let their guard down," a government official told the New York Times http://www.DFW.com/mld/dfw/news/nation/7555848.htm . "Al Qaeda has suffered some serious setbacks, but we know they're still capable of launching major attacks." "So "there's absolutely no evidence 'al-Qaeda' attacked the Empire on that fateful morning over three years ago -- or that al-Qaeda even exists"? "Not even "Masterminds of Terror" by Yosri Fouda and Nick Fielding, in which Fouda reports upon his (tape-recorded) interviews with Khalid Sheikh Mohammed and Ramzi Binalshibh in which they take full credit for the September 11 attacks on behalf of Al-Qaeda? ""The United States and its allies in the war on terrorism must defuse the widespread image of Al Qaeda as a ubiquitous, super-organized terror network and call it as it is: a loose collection of groups and individuals that doesn't even refer to itself as 'Al Qaeda.' Most of the affiliated groups have distinct goals within their own countries or regions, and pose little direct threat to the United States. Washington must also be careful not to imply that any attack anywhere is by definition, or likely, the work of Al Qaeda." afghanistan/story/0,1284,865454,00.html almost exactly a year ago. It should be a no-brainer that tortured people will tell their torturers whatever they want to hear. In "President" Bush's 2004 so-called "State of the Union Address", one of the first lies of a speech that was virtually all lies was stated when Bush claimed "our" armed forces are "....delivering hope to the oppressed, and delivering justice to the violent". But this lie has to be one of the sickest and most evil lies ever told; for the U.S. military has delivered complete hopelessness to the, what is now estimated to be, over 40,000 Iraqi citizens that they unconscionably and mercilessly murdered, as well as to the thousands upon thousands of Iraqis who were seriously injured and/or maimed for the rest of their lives, in the second Iraq war alone. In addition, U.S. armed forces have NOT delivered True Justice, either to the Iraqis or to themselves; as True Justice does NOT embrace, by any stretch of the lying imagination, murdering tens of thousands of innocent people, including people who were doing nothing but exercising their right(s), and duty(ies), to defend their sovereignty, as ALL countries have the right(s) and duty(ies) to do; NOR did "our" military AT ALL hold THEMSELVES accountable for, in the first place, the COMPLETE ILLEGALITY of that second Iraq war, or for THEIR OWN excessively violent, exceedingly criminal, atrocities that they committed in the process of carrying through that COMPLETELY ILLEGAL war. And the very fact that such a "war of aggression", as clearly defined by several international laws, IS AND WAS completely illegal, makes EVERY SINGLE act of aggression carried out by U.S. armed forces, including EVERY SINGLE support action that made it both possible and a reality, TOTALLY UNJUST! So where is the Justice for the "American" violence, for which ALL Americans should be completely shocked, revolted and repulsed?! Next, Bush adds further to the lies that overflow from him on a constant basis, by stating that, "(i)n their efforts, their enterprise, and their character, the American people are showing that the state of our union is confident and strong", when the polls have shown that the American people are very nearly divided right down the middle over both Iraq and policy(ies) threatening civil liberties BOTH abroad and at home, making the Truth of the matter that, when our country is so divided, the state of our union CANNOT possibly be so confident and strong! And more and more Americans ARE waking up to what is really going on, and standing up against it; especially those fully true Americans who are daily putting the very liberty, as well as the very safety, of their actual persons, on the line "for Truth, (True) Justice, and the (True) American way"; and the other half of "Americans" who are wrongly toeing the party line, are so at odds with those who are totally, non-violently and peacefully standing up for True Freedom, and nothing but the protection of our True Democracy and Liberties, that they are fraudulently claiming the latter are supposedly being traitors to, committing treason against, and betraying the United States, when it is those false accusers who are the ones thereby betraying, committing treason against, and being traitors to the omnipresent civil liberties and duties of freedom of speech and dissent to be a check and balance upon the abuse(s) of power by the U.S. government! So how, short of the true traitors violently turning on the True Patriots, perpetrated both by the civilians and "law enforcement authorities", that has already begun to occur in the latter, and the conflagration of both that is very soon to occur, can we be any more divided, and our "union" any more insecure and weak?! The next grossly-false lie that emanates from "Dubya" in this so-called "State of the Union" speech, is that the American people "....need to renew the Patriot Act", an act so egregiously against, in violation of, and so seriously abrogating the very, MOST IMPORTANT, freedoms for which "America" stands, or for which "America" is supposed to stand, including but not limited to the freedom(s) of dissent and speech embodied in the U.S. Constitution and Bill of Rights, that the country is being threatened, and is already having carried out against it to some extent from within, by the false patriots named above, the complete suspension of these civil liberties, the very foundation and bedrock of our democracy which, without the FULL respect for and upholding of same, will lead to the COMPLETE AND TOTAL collapse and destruction of ANY True Democracy in the United States, to FULL AND COMPLETE chaos, and to the imprisonment and murder of millions of innocent Americans for "daring" to exercise those foundational liberties of our very society! And with such social collapse, "America" will cease to AT ALL, or any longer, be a Truly Free country, and will then be nothing but a COMPLETELY totalitarian police state! This is what Bush and his cohorts really want; and they are already stopping at nothing to bring it about! So where is the greater and greater alarm, the True Strength, True Resolve, and the True Self-Determination that we as citizens of this country Truly Need in order to stem this black tide of destruction before it is forever too late?! Where is our Backbone and Willpower, and our True Courage to ONLY defend REAL Freedom(s) and Liberty(ies), and FULLY stand AGAINST ALL such threats to our TRUE Liberty(ies) and Freedom(s), NO MATTER WHAT BEFALLS US IN THE PROCESS?! Ever more serious lies go on and on with Bush's further fraudulent assertion that "....the people of Iraq are free", while it is more than obvious that they are NOT free, and that, while they are being ruled, and while they will continue to be ruled behind the scenes, by the usurper-government of the United States, which illegally, aggressively and mercilessly attacked, invaded, conquered, and subjugated their sovereign country, they will continue to NOT be free! And Bush then adds insulting lie to injurious lie by stating that "....the United States of America will never be intimidated by thugs and assassins", and that "(t)he killers will fail, and the Iraqi people will live in freedom". But the U.S. government, and its military, are instead, and will continue to be, the greater thugs and assassins; and yet "our" thuggery and assassination of tens of thousands of innocent people are supposedly okay and right! What a great, big, huge bunch of "smoke and mirrors", and a gigantic "crock of bull"! The "AMERICAN" killers are not failing; and, again, the Iraqi people will NOT live in freedom from the oppression and repression of the United States government, unless of course the "American" murderers are stopped by an act of God, and/or by their own people and government coming to their sense's and putting a stop to it; otherwise, the repression and oppression of the U.S. government will only increase and get worse and worse as the "Bush junta" already plans to do, and IS presently seeking to make a reality! The "American people" were promised "endless war"; and endless war they are getting! Yet still, half of the "American" populace is "bloodthirstilly" lusting (sic) after the blood of millions of innocent people, all in the name of so-called "freedom", or so it would seem! What's it going to be, people?! Are you going to continue to support endless murder, mayhem and bloodshed in the name of the so-called "freest country on earth"?! From the overflowing pot of lies gushing from "Dictator-Bush's" mouth, the next most-grievous lie streaming endlessly therefrom is that "....America is committed to keeping the world's most dangerous weapons out of the hands of the most dangerous regimes"; but, of course, he is NOT keeping the world's most dangerous weapons out of the hands of the world's MOST dangerous regime, the United States, or out of his own hands and the hands of HIS regime! To repeat it again because it needs to be repeated, the U.S. possesses MORE of the most dangerous weapons in the world than ALL of the other countries which possess them combined! In other words, that makes the United States the GREATEST threat to world peace, and to the safety and liberty of the rest of the world, than ALL of the other countries in the entire world combined! 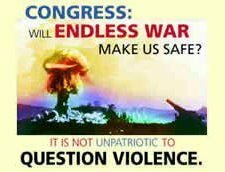 And don't say "America" isn't using, or won't use, them; because THEY ARE, and on a greater and greater scale; and they want to use more and more of those most dangerous weapons in further and further aggressive, illegal wars against other defenseless nations, without end! "Our" government has admitted such to us, very clearly! For Bush further states, among many other such lies and/or admissions that his regime has made, "....(t)he terrorists and their supporters declared war on the United States, and war they got"; yet the "Bush regime" is terrorizing the U.S. and the world with threat upon threat, and is continuously declaring war on the U.S. and the world over and over again, both to, and against, our safety and our liberty(ies)! But neither the vast majority of Afghani people, the previous Iraqi government as a whole, the Iraqi people as a whole, or the vast majority of the "American" citizenry declared war on the U.S., attacked the Pentagon, and/or destroyed the World Trade Center Towers! And, therefore, the "American" people and the rest of the world have more to fear from the "Bush junta", and the out of control U.S. shadow government, than from Osama bin Laden or al Q'aeda! So where is the backbone in the vast majority of our People and our government minority, to put a stop to all of this out of control terrorizing of, and declaring of war against, the "American" people and the rest of the world?! Bush and Company have again admitted, in very serious violation of international law(s), that they will not seek the authorization of the highest international world-governing body, the United Nations Security Council, to carry out wars of aggression against defenseless "third-world" countries, by additionally stating in the 2004 "State of the Union Address", that "....America will never seek a permission slip to (supposedly) defend the security of our country"; but, once again, Iraq did not attack us, OR HAVE ANYTHING TO DO WITH 9-11; therefore, the United States was NOT defending the security of our country when it made its unprovoked attack on, and invasion of, Iraq in 2003! Iraq had been very effectively disarmed during the previous total of ten years of weapons inspections and twelve years of sanctions, was little or no threat to us, we had little or nothing to fear from them, and Iraq was almost totally defenseless, particularly when compared to the military-might of the U.S. government; but, as is coming out more and more, "we" were sold a fraudulent "bill of goods", of lie after lie after lie supposedly justifying such a war of aggression, and such a war only previously perpetrated out in the open by the likes of Wilhelm's and Hitler's Germany, at least in relatively recent history; and Bush's junta sold it to "us" much like Hitler's regime did! On his lies unrelated to war, at least directly and/or obviously, Bush goes on to falsely claim in his speech that his administration will supposedly make us "....less dependent on foreign sources of energy"; in other words, less dependent on oil and natural gas; while at the same time he is making this spurious claim, the U.S. government, and its all-powerful military, are in the very process of taking over Middle Eastern oil reserves on a huge scale; such that there couldn't be any bigger lie on this subject than his making that seriously-fraudulent claim! Concerning the recently passed Medicare Prescription Drug Bill, Bush falsely alleges that it will provide great prescription drug benefits to the elderly and the disabled (of course, the disabled aren't mentioned at all in this regard, or anywhere in the speech); but the so-called benefits of this prescription drug plan are "shot full of holes"; and many, if not most, of the disabled and senior citizens have become aware of just how terribly flawed, and primarily favoring the pharmaceutical conglomerates, the "benefit" really is, and that it will NOT benefit them much, if at all! Bush also claimed that "America's" system of medicine is the best in the world; but he very conveniently failed to mention that it's also the most expensive medical system in the world, that he and his administration are in the process of making it much more expensive than it already is, by the passage of the Medicare Prescription Drug Bill and other destructive actions on their, and the Republicans and "Republicrats", part(s), and that the vast majority of "Americans" cannot afford "America's" "great health care system"! With "regard" to Bush's so-called "faith-based initiative" to fund religious organizations with huge amounts of government money(ies) in order to ostensibly provide "social services" to needy "American" people, Bush again makes very clear that his, and the far religious right's, attack on the Constitutional "separation of church and state" is being carried out "at every turn", "right and left", and is an "all-out" attack on another one of the greatest protections against despotism within the United States system of government; thereby leading to soon-to-be-instituted religious despotism in the U.S., and one-world religiously despotic governance of the entire world, of and by the U.S. government, that I have warned of elsewhere! Don't doubt it! The signs of its fast-approaching preparation and reality, as with Bush's plan to give government financial support to "faith-based" organizations, are all around us! What was palpably absent from this "State of the Union Address" of "Dubya's" was any mention of, or allusion to, dissent and/or the dissidents, making it very clear that he and his regime have chosen to stop talking about it for the most part, and instead are taking more and more decisive actions behind the scenes against the dissidents and his other critics, and to (completely?) curb and stifle freedom of dissent and speech, thereby overturning the U.S. Constitution and Bill of Rights and bringing about Orwellian police-state control of the entire country very soon, and the imprisonment and/or murder of many dissenters! In the "Republicrats" response(s) to Bush's speech this time around, except for making clear that the Bush administration is NOT ensuring the security of the state of our union, their responses were almost as lacking as Bush's, and were just as bad by also falsely claiming, along with the Bushites and the Republicans, that the state of our union IS supposedly secure, in spite of the Bush administration, and giving the false hope that the "Republicrats" will in any way actually correct and/or improve the deplorable condition that our "union" is in at the present time; thereby making it very clear that the epidemic of "Ostrich Syndrome" is now even more pandemic, that the infection is even more severe and out of control than ever before, that the distrust of all politicians is even more of a prerequisite now than ever before, and that Murphy's Law that whatever can go wrong will go wrong is becoming more and more true every day! The True Patriots against Bush-fascism, through having had war declared upon them thereby, have been issued a challenge by Bush and Company, one of the highest challenges ever given to True Americans, to wage non-violent, peaceful "war" against ALL of the threats to "....Life, Liberty, and the pursuit of Happiness (and/or Equality)" for ALL people, both in the United States and the world-over, without flinching and without stopping, NO MATTER WHAT; and millions of True American- and World- Citizens are rising to meet that challenge; but more True American and World Patriots must NOW be Truly Courageous, rise up, and join the swelling ranks of those standing up against U.S. corporate-military-industrial fascism! With God's help you CAN do it; so DO IT, and DO IT NOW! There is no time to put off doing your part in ANY, EVERY, and ALL ways YOU CAN! PLEASE DO IT NOW; AND WE WELCOME YOU TO OUR "ARMY"! END CORPORATISM! END CORPORATE-FASCISM! END CORPORATISM! END CORPORATE-FASCISM! END CORPORATISM NOW! THANK YOU! "Part I. The Prison Industry"
"Arrest! Need it be said that it is a breaking point in your life, a bolt of lightning which has scored a direct hit on you? That it is an unassimilable spiritual earthquake not every person can cope with, as a result of which people often slip into insanity? "The Universe has as many different centers as there are living beings in it. Each of us is a center of the Universe, and that Universe is shattered when they hiss at you: "You are under arrest." "If you are arrested, can anything else remain unshattered by this cataclysm? "But the darkened mind is incapable of embracing these displacements in our universe, and both the most sophisticated and the veriest simpleton among us, drawing on all life's experience, can gasp out only: "Me? What for?" "And this is a question which, though repeated millions and millions of times before, has yet to receive an answer. "Arrest is an instantaneous, shattering thrust, expulsion, somersault from one state into another. "We have been happily borne---or perhaps have unhappily dragged our weary way---down the long and crooked streets of our lives, past all kinds of walls and fences made of rotting wood, rammed earth, brick, concrete, iron railings. We have never given a thought to what lies behind them. We have never tried to penetrate them with our vision or our understanding. But there is where the Gulag [Prison] country begins, right next to us, two yards away from us. In addition, we fail to notice an enormous number of closely fitted, well-disguised doors and gates into these fences. All those gates were prepared for us, every last one! And all of a sudden the fateful gate swings quickly open, and four white male hands, unaccustomed to physical labor but nonetheless strong and tenacious, grab us by the leg, arm, collar, cap, ear, and drag us in like a sack, and the gate behind us, the gate to our past life, is slammed shut once and for all. "That's all there is to it! You are arrested! "And you'll find nothing better to respond with than a lamb-like bleat: "Me? What for?" "That's what arrest is: It's a blinding flash and a blow which shifts the present instantly into the past and the impossible into omnipotent actuality. "That's all. And neither for the first hour nor for the first day will you be able to grasp anything else. "Except that in your desperation the fake circus moon will blink at you: "It's a mistake! They'll set things right!" "....A submissive sheep is a find for a wolf. ""Resistance! Why didn't you resist?" Today those who have continued to live on in comfort scold those who suffered. "Yes, resistance should have begun right there, at the moment of the arrest itself. "But it did not begin. "....You really can and really ought to cry out---to cry out that you are being [falsely] arrested! That villains in disguise are trapping people! That arrests are being made on the strength of false denunciations! That millions are being subjected to silent reprisals! If many such outcries had been heard all over the city in the course of a day, would not our fellow citizens perhaps have begun to bristle? And would arrests perhaps no longer have been so easy? "....So why did I keep silent? Why, in my last minute out in the open, did I not attempt to enlighten the hoodwinked crowd? "....So why did I keep silent? "Every [person] always has handy a dozen glib little reasons why [they are supposedly] right not to sacrifice [themselves]. "Some still have hopes of a favorable outcome to their case and are afraid to ruin their chances by an outcry. (For, after all, we get no news from that other world [or very little], and we do not realize that from the very moment of arrest our fate has almost certainly been decided in the worst possible sense and that we cannot make it any worse.) Others have not yet attained the mature concepts on which a shout of protest to the crowd must be based. ...And where would the uninvolved, peaceable average [person] come by [the right] slogans? He simply does not know what to shout. And then, last of all, there is the person whose heart is too full of emotion, whose eyes have seen too much, for that whole ocean to pour forth in a few disconnected cries." "2. The History of Our Sewage Disposal System"
"It would have been impossible to carry out this 'hygienic purging', especially under wartime conditions, if they had had to follow 'outdated' legal processes and normal judicial procedures. And so an entirely new form was adopted: Extrajudicial reprisal ... which was the only punitive organ in history that combined in one set of hands investigation, arrest, interrogation, prosecution, trial, and execution of the 'verdict'." "5. First Cell, First Love"
"....In every case, out of all the cells you've been in, your first cell is a very special one, the place where you first encountered others like yourself, doomed to the same fate. All your life you will remember it with an emotion that you otherwise experience only in remembering your first love. And those people, who shared with you the floor and air of that stone cubicle during those days when you rethought your entire life, will from time to time be recollected by you as members of your own family. "Yes, in those days they were your only family. "What you experience in your first ... cell parallels nothing in your entire previous life or your whole subsequent life. No doubt prisons have stood for thousands of years before you came along, and may continue to stand after you too---longer than one would like to think---but that first ... cell is unique and inimitable. "But it was not the dirty floor, nor the murky walls, nor the odor of urine from the latrine ... that you loved---but those fellow prisoners with whom you [shared], and that something which beat between your heart and theirs', and their sometimes astonishing words, and then, too, the birth within you, on that very spot, of free-floating thoughts you had so recently been unable to leap up or rise to. "And how much it cost you to last out until that first cell! You had been kept in a pit, or in a box, or in a cellar. No one had addressed a human word to you. No one had looked at you with a human gaze. All they did was to peck at your brain and heart with iron beaks, and when you cried out or groaned, they laughed. "One night of undisturbed sleep was more important than all the fates on earth! "What a cozy life! Chess, books, cots with springs, decent mattresses, clean linen. I could not remember having slept like this... One could take nearly four strides from the window to the door in the aisle between the cots. No, indeed! This central ... prison was a real resort. "All right then, the hell with you; if you don't want me to fight, I won't...."
"8. The Law as a Child"
"There was an official term current then: Extrajudicial reprisal ... not because there weren't any courts at the time, but because there was terror. Because it was more efficient. Certainly there were courts, and they tried and convicted and executed people, but we need to remember that, parallel to them and independently of them, extrajudicial reprisal went on at the same time. How can one depict its scale?...." And the foregoing list is without even going to Kaminski's list, as well as points out the fact that you, "Damfa", clearly didn't go to Kaminski's list either (which I don't need to do because I already know so much of it, though I will do so later to learn what's "new" that I can learn on the subject---postscript: having now gone to and read said list, it is very important that all of you who are reading this go to Kaminski's list and read it for yourselves!) before you start(ed) promoting your doubts! So, "Damfa", et alii, your kind(s) of denial(s) is/are, again, just what Bushco and the shadow government are depending on in the majority of Americans! So, please, get fully educated on the subject before you write such "doubting Thomas", mis- and un- informed "denials"! The only thing I have somewhat of a problem with in what Kurt wrote in the instant article, is whether or not we should be giving so much "attention" to the likes of David Corn, for it serves to keep his name and his "Damfa-form" of denials even more alive in the ethernet, which he, and all of those like them, obviously don't deserve, not to mention the harm that it does to the "cause" of Truth and not continuing to live in denial about the far-too-many facts to be coincidence and/or to be anything but true! I guess The Nation is trying to give both sides of the story by allowing someone like David Corn to continue to promulgate his denial(s); but they've told so much Truth on the subject, so they should get rid of all of the likes of him, for he and they only detract from and help the discreditors of their good work, limiting it, which we don't have the luxury of the time for in this extremely serious time we are living in right now! When famous whistle-blower Daniel Ellsberg boarded a plane to Cincinnati earlier this week, he took along a little light reading: a stack of articles about former counterterrorism czar Richard Clarke, who has stirred controversy with allegations in his book and testimony before a special panel that the Bush White House was somewhat indifferent to al Qaeda before Sept. 11 and obsessed with Iraq afterward. Ellsberg, who in 1971 leaked the Pentagon Papers documenting government misrepresentations about the Vietnam War, sees Clarke as part of a trend: well-placed individuals in the government who have gone public with books or interviews outlining their concerns and criticisms about their country's government--while that government is still in power. Ellsberg is not alone in that observation--observers from across the political spectrum, whether they support Clarke's actions or not, agree that a new willingness exists to tell all far sooner, and far more publicly, than in the past. Ellsberg cites officials such as Scott Ritter, the former lead inspector for the U.N. Special Commission on Concealment and Investigations team, and Katharine Gun, a British government linguist who leaked an e-mail purportedly from U.S. intelligence services asking for help spying on U.N. ambassadors. Opinions differ on whether the willingness to tell all is a good thing, but to Ellsberg, who has been sharply critical of the war in Iraq and even written articles encouraging current government employees to leak what he calls "Iraq's Pentagon Papers," the phenomenon is a source of optimism. "I think these people are heroes. They're really acting appropriately in a very dangerous situation," he said. "It's as if we are learning about the Tonkin Gulf a month or two later instead of years later." Although Ellsberg, now 72 and living in Kensington, considers Clarke somewhat of a kindred spirit, he doesn't quite see him as a whistle-blower. Clarke was no longer an employee of the administration when he spoke out and did not provide documentation to back up his accusations--accusations the administration has rejected. Ellsberg said the only real whistle-blower of recent times is Gun, who briefly faced charges under the British Official Secrets Act and supported her claims with documents. "I find her really admirable," Ellsberg said, but he considers the rest remarkable, too, for being willing to go public in a way and with a speed that simply didn't occur 40 years ago. "Why are they acting differently from people in my generation?" he said. "We knew (Vietnam) was just as deceptive and the policy was just as bad, but we certainly weren't tempted to leak." At least, not until Ellsberg did it. But since then, a number of observers said, going public early and often has become more and more acceptable, even among ranking government officials. . . .
Clarke's book, because of his position, may be taking the trend to a new level, said Peter Berkowitz, a research fellow at the Hoover Institution and an associate professor of law at George Mason University Law School. "I do think what Clarke has done is really unprecedented in our history: somebody who served as a national security adviser to the president stepping down and, while that president is still in office, blasting him," he said. "That just hasn't been done before" . . . .
"You're seeing an evolution of our society. Ellsberg is essentially the first modern whistleblower. As a result, the news media observed how important obtaining this type of information was and how it was the ultimate lifeline to a free society," [Michael Kohn, general counsel for the private National Whistleblower Center] said. "As this message began to take root, the will of people to expose information at an earlier point of time has just gone with it" . . . .
[T]o Ellsberg, the fact that a number of Bush's own people have been willing to break that presumption of loyalty is a strong condemnation of the president and his neo-conservative allies, something Clarke himself has hinted at in public statements. Asked on "60 Minutes" whether he owed loyalty to the president, Clarke responded, "Up to a point. When the president starts doing things that risk American lives, then loyalty to him has to be put aside." -- Scott Ritter, the former lead inspector for the U.N. Special Commission (UNSCOM) Concealment and Investigations team in Iraq. -- Hans Blix, the former U.N. chief weapons inspector in Iraq. -- Former Treasury Secretary Paul O'Neill, whose January book about his tenure inside the Bush administration was based, in part, on classified documents. -- Rand Beers, who quit as President Bush's antiterrorism adviser to become John Kerry's foreign policy adviser. -- Joseph Wilson, a former ambassador who investigated whether Iraq tried to buy uranium from Niger and later publicly accused the White House of manipulating his findings. -- John Brady Kiesling, a career U.S. diplomat who resigned to protest the Bush administration's policies on Iraq. -- Ray McGovern, a retired CIA analyst on the steering committee of Veteran Intelligence Professionals for Sanity. -- Robin Cook, a former British foreign minister who quit and wrote a book saying the threat of Iraq was overblown. -- Katharine Gun, a British government linguist who was charged under the British Official Secrets Act for leaking an e-mail purportedly from U.S. intelligence services asking for help spying on U.N. ambassadors. -- Anthony Zinni, retired Marine general and former U.S. commander for the Middle East who has criticized the handling of postwar Iraq. -- Clare Short, a former international development secretary who resigned from British Prime Minister Tony Blair's government in protest after the invasion and later said she had seen transcripts of bugging of Kofi Annan's office. -- Karen Kwiatkowski, a retired lieutenant colonel formerly assigned to the Pentagon's Office of Special Plans who wrote an article critical of the war on the online site Salon.com -- entitled "The New Pentagon Papers." ""I say we had better look our nation searchingly in the face, like a physician diagnosing some deep disease." -Walt Whitman, "Democratic Vistas""
"I go in fear of those for whom belief is fervent, for whom belief is absolute. I have lived through generations of war, through the misery and slaughter of countless millions of innocent people. Almost invariably, this floodtide of bloodshed has been authored in the name of god and justice. The god of George W. Bush, Osama bin Laden, and Ariel Sharon is (supposedly) the same god. And yet when I turn to the holy scriptures of their respective religions, I find the same prohibition against murder, the same call for genuine compassion, for lives of non-violence. "I admit that I am not a believer. Nevertheless, I have been deeply touched by the teachings of Jesus, of Muhammed, of the great rabbis and monks and followers of these traditions who have had the courage to take to heart the practice of compassion. When I founded Poets Against the War in January, 2003, much was made of my remark that I felt a wave of nausea upon reception of an invitation to the White House the morning after reading of Mr. Bush’s proposed plans for a "shock and awe" attack on Iraq. In my defense I can say only that I remain baffled by anyone who is not utterly repulsed by the idea of annihilating whole cities, by the suggestion that we may somehow regain our humanity or any sense of justice through the employment of cluster bombs and smart bombs followed by waves of infantry. "Since the end of World War II, the United States has bombed some forty-two countries, and with each devastating bomb, the American people have been told that our government has taken such action in the name of decency and democracy and justice. "God," we are told again and again, "is on our side." And yet the Pope beseeched this administration not to attack Iraq. Clergy from around the world begged for patience from this administration, begged for genuine dialogue with this administration, an administration that has publicly announced its religious convictions, its absolute fervor and absolute belief. Their pleas were met first with a resounding silence, and then with missiles and bombs and bloodshed that has now entered its second year with no end in sight. "Mr. Bush and his co-conspirators may call themselves Christians, but they violate almost every tenet of Christian conduct. They practice neither love nor compassion. They try to "justify" torture. That they murder and lie and are hypocrites is established fact. That they and their corporate co-conspirators profit on a grand scale (both politically and economically) from the gross human misery and bloodshed they author is also beyond question. Nor can we doubt for even a minute that their ultimate plan is to dominate and exploit the whole world under the blueprint of their Project for the New American Century. Among the worst of their co-conspirators we must include a thoroughly cowed and "embedded" body of American journalists for whom truth is a relative and sometime thing, for whom the merest veneer of patriotism is a greater force that healthy skepticism and devotion to truth and, ultimately, humanitas. The American media are owned and operated by corporations who profit from this and every war. "Mr. Bush, Mr. Sharon, Mr. Arafat and Mr. bin Laden share a religious fervor and certitude that trivializes the innocent lives of those they annihilate in the name of justice. They are brothers in evil certainty that authors gross violence. Their only response to terror is to elevate levels of terror. Each has chosen vengeance and the horrors of human slaughter over the forces of decency and dialogue. "Vengeance is mine, saith the Lord." ""Blesséd are the peacemakers." I was taught that in the original Hebrew, the commandment reads, "Thou shalt not murder." I’m told that the true Christian and Muslim and Jew alike are taught, "Love thy enemy as thyself." Or as a brother. If we murder every murderer, there will be no one left. "I believe there are vital lessons to be learned from poetry, indeed that poetry can be a path to enlightenment. I think often during these war-torn days of the great courage it took for poets like Kenneth Rexroth, Stanley Kunitz, Robert Lowell, William Stafford, and William Everson to reject the politics of annihilation during World War II (during which I was born), and to choose imprisonment or nonviolent service over obedience to the mere appearance of patriotism. The true American patriot is one who defends the Constitution against the likes of Mr. Bush, Mr. Ashcroft, Mr. Rumsfeld, Mr. Cheney and their ilk, one who understands exactly why the first of our guaranteed rights is the right to speak out. That right and all others come with responsibilities every poet should understand. "We all live our lives by those few well-chosen words we stand by. I draw inspiration from the courage of Albert Camus as he spoke against war in the very midst of World War II, as well as against capital punishment. I think of the courage of Gandhi, the courage of Martin Luther King. And when Mr. Bush decries leaked photographs of the flag-draped coffins of America’s young men and women being returned from the front, I draw inspiration from the heart-rending courage of the mother of Emmett Till, a young man savagely beaten to death by white racists long ago in Mississippi. She demanded that his coffin be left open at his funeral, his shattered, ravaged body on full display "because," she said, "I want people to understand exactly what transpired here." "We poets have been attacked for the stance we have taken. We have been attacked for speaking out. We have been accused of being unpatriotic because we do not believe that compounding murder is the best possible response to murder. It grieves us to see our nation’s (or any nation’s) children turned into killers before they have had the opportunity to study war and its vicious and inevitable consequences. "Every war produces a My Lai, an Abu Ghraib. And we are treated to speeches justifying torture. But it is not merely the wars in Iraq and Afghanistan or the war between Israelis and Palestinians that motivates me now. These, I believe, are only symptoms of the devastating disease, the malady that causes a nation’s government to treat the suffering and annihilation of human beings as a trifling thing on the road to power and profit. As long as we permit our government to be rented out to the highest bidders, democracy and peace will remain mere ideals. We make the world safe for global capitalism at the expense of our own well-being. "I believe we can do better. I believe Poets Against the War stands for a great deal more than just poets opposing another illegal and immoral war. I believe every poet’s struggle to come to a truth through a few fortunately chosen words is good medicine, and I believe that doubting and questioning are the very foundation of any patriotism that rises above mere nationalism. "The many faces and voices of poetry in the world connect us all to one great family. The uses of our art are countless, but the political remains one of our responsibilities. Poetry is one of a thousand paths to a more enlightened life. I want to know what poetry was in the lives of the prisoners tortured at Abu Ghraib, what poetry is in the lives of their torturers. What poetry is in the life of a man who slits the throat of another to make a political advertisement? Are there verses Mr. Rumsfeld and Mr. Ashcroft know by heart? "Yes, Mrs. Bush, and yes, Mr. Gioia, poetry is political. Being a citizen of the world is political. That’s one of several obvious reasons why we believe poetry really does matter.